We know you love dual Berettas, but it's time to let go. 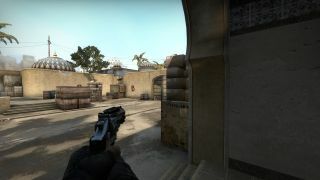 It’s impossible to perfectly balance any game, but the money system in Counter-Strike: Global Offensive has succeeded in making an astonishing number of weapons viable—more so than in any previous version of the game. Most of the guns in CS:GO are useful in the right circumstances, but even so there are a few that aren’t worth your precious dollars. In this article I’ll go over the weapons I think are either bad or over-priced. Remember that these are my opinions: everybody’s preferences are different. As you can see it’s highly inaccurate. I suppose if you give it some time, eat your vegetables and practice like there’s no tomorrow, you can probably hit a parked bus from two feet away. With a bit of luck. But then you consider that the R8 costs $850, which is $150 more than the Desert Eagle. Even if they both cost the same, I can’t find a good reason why anyone would prefer the R8. These guys may look cool, but twice as many pistols doesn’t mean twice as good. They have high rate of fire and lots of ammunition, but they aren’t accurate at all. If you want to invest $500 in a pistol, that money is better spent on a Tec-9, CZ75-Auto or a Five-Seven. Some of you might argue that Christopher ‘GeT_RiGhT’ Alesund from NiP has used the Dual Berettas a lot in the past, but I would suggest that he would’ve been better off with a different pistol. The PP-Bizon’s magazine holds 64 bullets, which is a lot—more than any other SMG in the game. But it stops there. The PP-Bizon has inferior damage, accuracy and armor penetration, which are the three most important qualities you look for in a weapon. It’s simply not worth investing in. All the other SMGs can do what the PP-Bizon can do but better, except shoot 64 rounds without reloading—but by that time the player using the PP-Bizon is usually dead. The AUG is an assault rifle used by the CTs. It has incredibly good armor penetration and its damage isn’t bad. It’s also pretty accurate if you know how to use it. Why wouldn’t I recommend that anyone use it, then? Because it costs $3300. That’s $200 more than an M4A4 or M4A1-s. You get a scope that gives you a smaller field of view when you can shoot just as accurately if not more with any of the M4s without the scope. The AUG isn’t a bad weapon per se, but it doesn’t make sense to buy one instead of an M4. The SG 553 or Krieg 553 is the terrorist counterpart of the AUG. It’s basically the same weapon (give or take a few points here and there) but it costs a massive $3500 when you can get an AK-47 for $2700. In my opinion the AK-47 is the best assault rifle in the game. Compared to the AK-47, the SG 553 is an awful weapon that no one should buy. Ever. Essentially, the SG 553 is a very expensive AK-47 that’s a lot harder to control. These are the classic troll weapons in Counter-Strike. Getting killed by any of these weapons means you just got owned. It’s almost as bad as getting knifed, and no one wants to get knifed in CS:GO. Both the M249 and the Negev have a lot of spread and high recoil. They do put out a lot of damage per second: if you spray. The problem with spraying with these weapons is that they’re almost impossible to control. Admittedly the first bullet is pretty accurate, but that alone doesn’t warrant a price tag over $5000. What really makes them bad weapons is the fact that they slow down your movement more than any other weapons in the game—more than the AWP, even. We all know that being mobile is the key to staying alive in Counter-Strike: Global Offensive, and you’re not while you’re using heavy machine guns. This time NBK accidentally bought the Negev but decided to keep it. All I can do is guess, but I think the guys from former Copenhagen Wolves wish that round never happened. As you can see it’s still possible to make big plays with weapons you’re not ‘supposed’ to use. CS:GO is a skill-based game and if you’re good enough you can make anything work. I do however strongly recommend that you stick to weapons that make more financial sense to buy. You’ll simply win more games that way.